The enormous white cross that overlooks the Pacific Ocean atop the Mt. 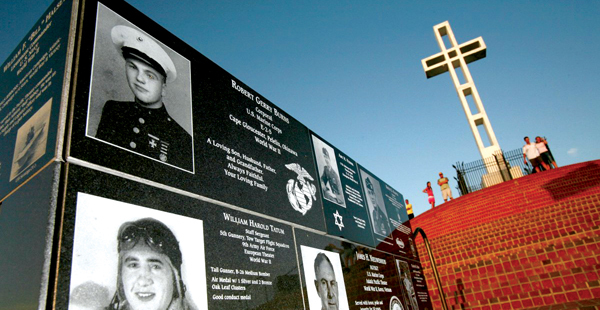 Soledad Veterans Memorial in San Diego isn’t going anywhere. The Mount Soledad Memorial Association, the veterans’ group that maintains the memorial, purchased the half-acre of federal land on which the 29-foot Latin cross stands from the Defense Department for $1.4 million July 21. The purchase brings to a close an epic 25-year legal battle, spurred by a 1989 lawsuit from Vietnam War veteran and atheist Philip Paulson, who argued the cross violated the Constitution’s prohibition against state-established religion. “I am honored to be leading our association at this most significant time in our memorial’s history,” said Bruce Bailey, president and CEO of the Mount Soledad Memorial Association board of trustees, which bought the property, in a statement. “It marks the first time where our membership can manage the memorial’s affairs from a place of ownership and accountability for the property, which is a new and welcomed step for the association,” Bailey said. The sale was made possible by the passage of the National Defense Authorization Act of 2015, which called for the property to be sold by the federal government to the association. The organization has managed the memorial since its inception in 1954. In 2006, Congress took ownership of the land from the city of San Diego via eminent domain, a move championed by former U.S. Rep. Duncan Hunter (R-Alpine), who previously represented the area. His son, U.S. Rep. Duncan D. Hunter (R-Alpine), took up the cause after succeeding his father in Congress in 2009, authoring the provision in the defense bill that cleared the way for the sale and transfer of the property to private ownership. San Diego attorney James McElroy, representing a Vietnam veteran, told the LA Times that he and ACLU lawyers plan to study the sale agreement and then meet with lawyers representing the government and the memorial association. “We may be getting near the end [of the case], simply for legal and pragmatic reasons,” said McElroy, who filed the first case against the cross in 1988. The case, the most prominent of several lawsuits involving crosses at veterans’ memorials, was appealed twice to the U.S. Supreme Court, which declined to take it up both times. The cross had a close call In 2013, when a federal judge ordered it taken down. Voters in San Diego weighed in on two ballot measures, first rejecting a referendum to transfer the memorial land owned by the city to a private entity, and then approving a proposal to transfer the land to the federal government. In addition to the cross, the memorial holds 2,700 black granite plaques with the names and photos of war veterans.